Featuring 10 ports, USB-C Dock brings the connectivity you need back into your day-to-day. USB-C Dock is complete with five USB 3.1 Gen 1 ports - including two high-power charging ports and one USB-C port. For even more connectivity, the USB-C Dock also features Gigabit Ethernet, HDMI and combo audio ports along with an SD card reader. Connectivity is only part of the solution. 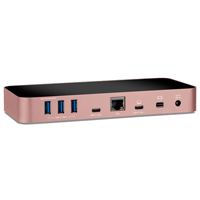 Of course, the OWC USB-C Dock gives you all the options you need simultaneously, delivering 80W power to connected devices, including 60W through the computer link port. OWC USB-C Dock is designed to deliver the ultimate connectivity in both function and form to match any style. An aluminum chassis completes the design story, so the dock is robust enough to handle any situation. 7.9" x 3.5" x 1.1"